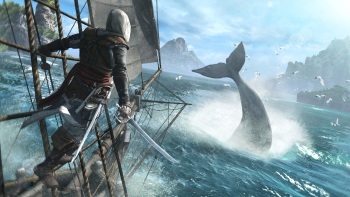 Ubisoft says it does not condone poor hygiene, hijacking ships, drunken debauchery - or illegal whaling. Assassin's Creed IV: Black Flag, as we now know, will be a swashbuckling tale of high-seas shenanigans set in the early 18th-century Caribbean, an era of piracy, plunder, murder - and whaling, which has People for the Ethical Treatment of Animals wound up yet again over a videogame. "Whaling - that is, shooting whales with harpoons and leaving them to struggle for an hour or more before they die or are hacked apart while they are still alive - may seem like something out of the history books, but this bloody industry still goes on today in the face of international condemnation, and it's disgraceful for any game to glorify it," a PETA rep said. "PETA encourages videogame companies to create games that celebrate animals - not games that promote hurting and killing them." It's kind of a silly thing to get worked up about, especially since PETA appears to have no problem with the wholesale slaughter of virtual human beings for fun and profit, but Ubisoft nonetheless took a moment to respond in what I think is both an even-handed and subtly zingtastic fashion. "History is our playground in Assassin's Creed. Assassin's Creed IV: Black Flag is a work of fiction that depicts the real events during the Golden Era of Pirates," the publisher said in a statement. "We do not condone illegal whaling, just as we don't condone a pirate lifestyle of poor hygiene, plundering, hijacking ships, and over-the-legal-limit drunken debauchery." The International Whaling Commission placed a ban on commercial whaling in 1986 in order to allow depleted whale populations an opportunity to recover, but some nations continue the hunt.